Commissioner of School Education (CSE), Andhra Pradesh (AP CSE) has released AP DSC Recruitment Notification-2018 for the post of 1488 vacancies for the posts of Principals, Post Graduate Teachers(PGTs), Trained Graduate Teachers(TGTs), Physical Education Teachers(PETs), Craft, Art and Music Teachers in Residential Schools. The Recruitment has complete details about their notification on its official website i.e., schooledu.ap.gov.in and careers99.com. This is a good news for those who are waiting for Andhra Pradesh Govt Jobs. Candidates may apply offline before the Last date of the Notification i.e., 16th Nov 2018. And the remaining details for the recruitment like Educational Qualifications, Eligibility criteria, Age limit, No of vacancies, Post names, Pay scale, Job location, Application fee, Important links, Procedure to Apply are mentioned below. Commissioner of School Education (CSE), Andhra Pradesh (AP DSC) has released Notification for the posts of Principals, Post Graduate Teachers(PGTs), Trained Graduate Teachers(TGTs), Physical Education Teachers(PETs), Craft, Art and Music Teachers having 1488 vacancies on its official website schooledu.ap.gov.in. Interested and eligible candidates can Apply Online before the Last Date i.e., 16th Nov 2018. Required details like educational qualification, age limit, Selection process of AP DSC Notification 2018-19 are given below. 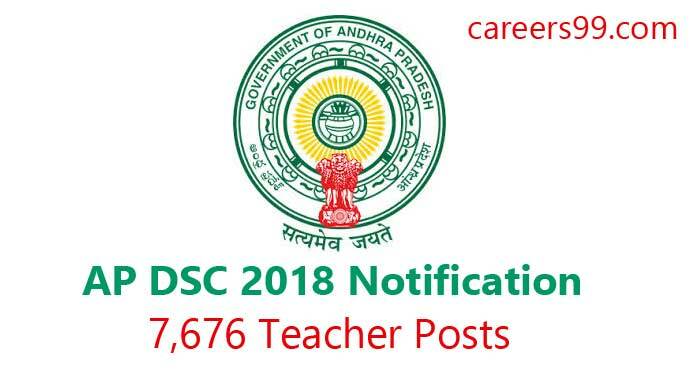 AP DSC Recruitment 2018 – Apply Online for Principals, Post Graduate Teachers(PGTs), Trained Graduate Teachers(TGTs), Physical Education Teachers(PETs), Craft, Art and Music Teachers Posts: Commissioner of School Education (CSE), Andhra Pradesh (AP DSC) has advertised a notification for the recruitment of 1488 posts of Principals, Post Graduate Teachers(PGTs), Trained Graduate Teachers(TGTs), Physical Education Teachers(PETs), Craft, Art and Music Teachers vacancies. Eligible candidates can apply online from 01st Nov 2018 to 16th Nov 2018. Other details like age limit, educational qualification, selection process & how to apply for AP DSC Jobs are given below. Interested Job Aspirants who are ready to apply for Commissioner of School Education (CSE), Andhra Pradesh 2018 Notification must possess the below-given Eligibility Details. No person shall be eligible for direct recruitment to the post of Teacher if he/she is less than 18 years of age and not more than 44 years of age as on 1st day of July of the year 2018 in which the notification for selection to the relevant post, category or class or a service is made. However, in case of SC / ST / BC candidates the maximum age limit shall be 49 years and in respect of Physically Challenged candidates the maximum age limit shall be 54 years. Selected candidates will get As per AP Govt Rules by the Recruiting Organization. Eligible and Interested Aspirants are requested to Download Application Form from Below link of schooledu.ap.gov.in Website and Submit it to the mentioned Address before the Last Date i.e., 16th Nov 2018. First of all, Open Official Website i.e., schooledu.ap.gov.in or Below Mentioned link from careers99.com Website.